On February 2, 1971, an international treaty for the conservation and wise use of sustainable wetlands called the ‘Ramsar Convention on Wetlands‘, was adopted in the Iranian city of Ramsar, on the shores of the Caspian Sea. It provided the framework for national action and international cooperation. In 1997, World Wetlands Day celebrated for the first time made an encouraging beginning. In layman’s words, a wetland is a land area saturated with water, either permanently or seasonally, such that it takes on the characteristics of a distinct ecosystem. Every continent has its own Wetlands that occur naturally except Antarctica. The Amazon swamp forests and the Siberian peatland are the largest wetlands in the world. Another large wetland is the Pantanal, which straddles Brazil, Bolivia, and Paraguay in South America. The primary factor that distinguishes wetlands from other landforms or water bodies is the characteristic vegetation adapted to its unique soil conditions. Primarily wetlands consist of hydric soil, which supports aquatic plants. A hydric soil is formed under conditions of saturation of soil with water, seasonally by flooding, or permanently by ponding (pooling of unwanted water) long enough to develop anaerobic conditions in the upper part. This term is part of the legal definition of a wetland included in the United States Food Security Act of 1985 (P.L. 99-198). There are four main kinds of wetlands: marsh, swamp, bog and fen. Sub-types include mangrove, carr, pocosin, and varzea. Some experts also include wet meadows and aquatic ecosystems as wetland types. Marsh is a flat, wetland area, devoid of peat, saturated with moisture during one or more seasons. Typical vegetation includes grasses, sedges, reeds and rushes. Marshes are valuable wetlands that maintain water tables in adjacent ecosystems. Swamp is a low-lying wetland area found near large bodies of open water in such places as low-lying coastal plains, floodplains of rivers, and old lake basins or in areas where glacial deposits have disrupted normal drainage. An abundant growth of rushes and sedge characterize swamps in the northern regions. Trees, such as the swamp cypress and high shrubs dominate southern regions. 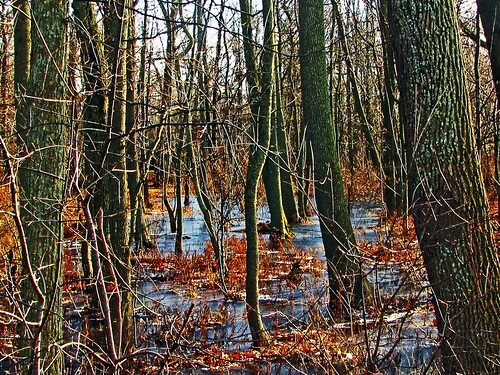 Swamps can prevent flooding by absorbing floodwaters from rivers and coastal regions. Bogs and fens (in eastern England) are types of mires – an area of wet, soggy, muddy ground. Bogs receive their water from the atmosphere. Their water has a low mineral ionic composition because ground water has a higher concentration of dissolved nutrients and minerals in comparison to precipitation. Bogs have acidic soil. Fens, also known as the Fenland(s), are natural marshy regions in eastern England. A fen is the local name for an individual area of marshland or former marshland and also designates the type of marsh typical of the area. Most of the fens drained several centuries ago, became flat, damp, low-lying agricultural regions. Water in wetlands along the coastal shorelines is invariably salty or brackish. Water found in inland wetlands can also be fresh water. Wetlands have many vital and fascinating characteristics that play a number of roles in the environment while also providing recreational opportunities. Wetland systems improve water quality, control floods and buffer coastal communities from erosion vital for shoreline stability. Wetlands are the most diverse of all biological ecosystems. They comprise a range of plants that provide essential food and habitat for various wildlife such as fish, birds, reptiles, insects, etc. The wetlands are pivotal to 75% of world’s migratory birds. More than half of the fish caught for recreational or commercial purposes depend on wetlands at some point in their life cycles. Wetlands can also be constructed artificially to serve as a water management tool in the design of water-sensitive urban areas. Frankly, much of the report compiled by the world environmental agencies, the U.S. Fish and Wildlife Service and the National Oceanic and Atmospheric Administration (NOAA) do not portend well. For example, NOAA has authored a report, “Status and Trends of Wetlands in the Coastal Watersheds of the Conterminous United States 2004-2009,” with the U.S. Fish and Wildlife Service that summarized the status and trends of coastal watersheds. According to the report, the coastal watersheds of the continental United States lost wetlands at an average rate of 80,000 acres a year during the study period – an area about seven football fields every hour, and a 25% increase over the previous six-year study period. The loss of these valuable wetlands threatens not only the sustainable fisheries and protected species, but also the supply of clean water and stability of shorelines in the face of climate change. Almost half of the population in the United States now lives in coastal counties. Continued loss of coastal wetlands means less protection for those communities in the coastal counties from strong storms, such as Superstorm Sandy. Key factors in the degradation and loss of wetlands in coastal watersheds are directly traced to population growth and its associated development — both residential and infrastructure, changes in water flow, and increased pollution. Imagery from Earth-observing satellites that map changes in wetlands, however, show that while Mediterranean wetlands had been principally used for agriculture, less wetland areas have been changed by agriculture in the past 10–15 years. This indicates that agriculture expansion is no longer a severe threat and successful agricultural practices can actually support healthy wetlands. Agriculture needs wetlands for water, pest management, pollination and landscape improvement. At the same time, agricultural land acts as a buffer zone around wetlands, protecting them from developing industrial zones and urban areas. This cohabitation shows that wetlands and the agriculture sector are mutually beneficial. Recognizing this connection, common strategies for wetland and agro ecosystem-conscious management are on global agendas. Previous PostBabies and Crayons…Next PostA Daughter in Bengaluru.